With college football’s 2013 regular season complete, the die has been cast for the final bowl pairings under the BCS system. Next year, or in exactly 385 days, 9 hours, 56 minutes, and 25 seconds as of this writing, the College Football Playoff © will be in place. With the death of the BCS effectively accomplished, this is a good time to consider how the college football world will be different 385 days, 9 hours, 52 minutes, and 34 seconds from now. One of college football’s biggest challenges, from an institutional perspective, has been its ability to crown a consensus national champion at year’s end. The first memory I have of controversy in this regard was the 1997 split championship between Michigan and Nebraska that precipitated the implementation of the BCS in 1998. (I don’t know if that decision actually precipitated the BCS, because that system may have been in the works already, but it felt that way at the time.) The BCS did not bring peace and happiness across the land, however, and the criticism that started then– I recall writing [a crude] editorial on the arbitrariness of BCS outcomes as sports editor of a newspaper in the early 2000s– has only grown in scope and volume, even reaching the halls of the U.S. Senate and the Department of Justice, and the favors it grants upon certain athletic conferences certainly has been part of the fuel for the conference realignment conflagration that burns to this day. A playoff was demanded, and a playoff will be had. The playoff system that will be in place next year wasn’t the first proposed college football playoff system: In 1966, Michigan State coach Duffy Daugherty proposed an eight-team, basketball-style playoff instead of the familiar and expanding constellation of postseason bowls. It is the one we’ll have, though, and it will be a four-team affair, at least to start, and it will function within the existing bowl infrastructure, because the bowls are independent, monied ventures and will not surrender their profit streams (or even obey the law). What would happen if the playoff system was in place this year? Assuming the teams finished the season ranked the way they were under the BCS, we would see semifinal games between Florida State and Michigan State and an Iron Bowl rematch of Auburn and Alabama, with the winners playing in the championship game. The assumption about the rankings is the underexamined part of this story. People wanted a playoff system because they were dissatisfied with the limitations of having only one national championship game in seasons when more than two teams had very strong claims to the national championship. 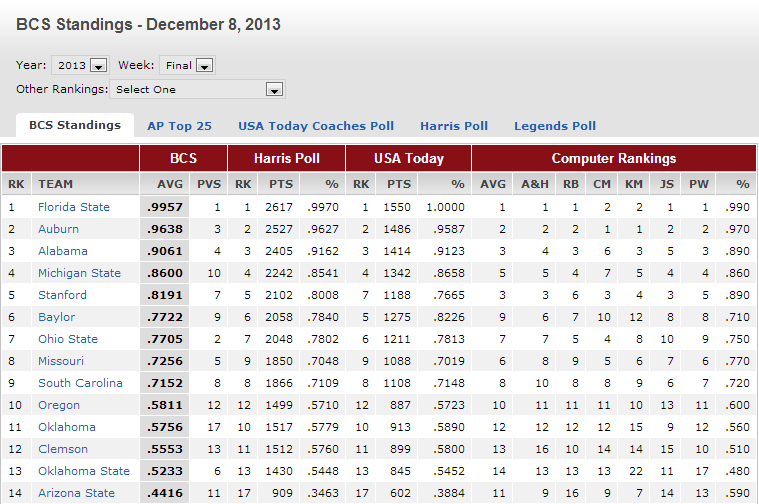 Any dissatisfaction with rankings were derivative of dissatisfaction with the limited access to the championship game. 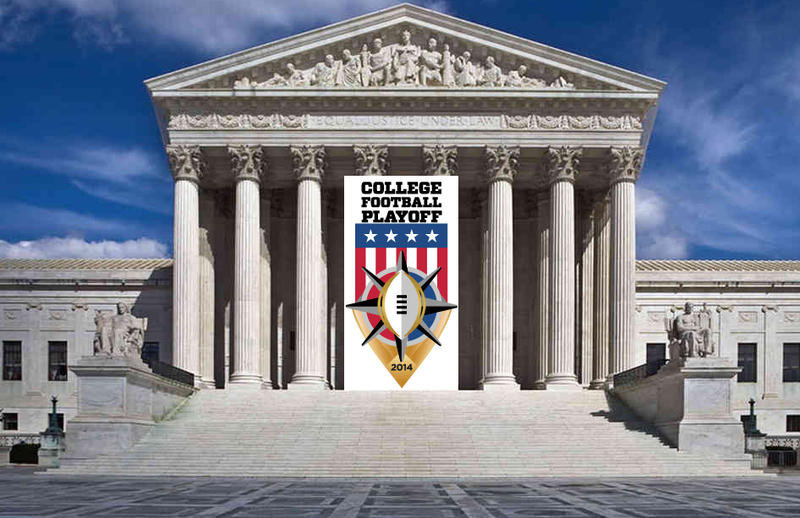 Like any new American corporate creation– and the College Football Playoff © surely is that– there’s a selection committee for the Selection Committee. The former is known as the College Football Playoff Management Committee™, and it’s comprised of the commissioners of the ten main college football conferences. The Selection Committee itself is comprised of thirteen people. Conservatively, six of these people, by the one-line biographical descriptions on the College Football Playoff © website (dot commercial), have conflicts of interest, and that’s a tally so conservative I didn’t even include Tom Osborne. Yes, we want people interested (colloquial definition) in college football to be making college football decisions, but, structurally, the Selection Committee suffers from transparency and sample-size problems for which the BCS polling setup would offer an improvement. Plenty of others will break down these technical transparency problems for as long as the college football postseason is administered in this fashion, and there is value in conducting that analysis. What interests me is the practical way in which behavior will shift under the new system. Although the exact timing has yet to be determined, the selection committee will meet several times in person to evaluate teams and prepare interim rankings during the regular season. It will meet again during selection weekend and will announce the pairings for the playoff. There also is no indication of the format of those interim announcements. Will the Committee reward teams for playing difficult schedules, for running up the score to record bigger wins, or for minimizing losses regardless of the quality of the competition? What is the relative importance, to these Committee members, of these and other factors? Can team from outside the power conferences ever make the playoffs? How? Without a known evaluative rubric and regular, detailed informational updates, coaches and athletic directors will be left to guess at how best to position their teams in order to receive a playoff invitation, and they are likely to receive very limited feedback about the Committee members’ preferences and reactions to those decisions. Members of the Supreme Court Bar learn the justices’ tendencies and preferences through an educated trial-and-error (sorry) approach, studying past decisions for clues, offering new arguments based on those clues, and waiting with everyone else for months for a ruling that might endorse one of those arguments or none of them at all. College football will take a big step forward when it adds a two-round, four-team playoff, but it will take a step backward when it replaces the BCS ranking system with the College Football Playoff Selection Committee. Before the playoff structure is expanded to include more teams, the first round of reforms should be the elimination of the Selection Committee, to be replaced with a ranking system that is transparent and receives input from more than thirteen people. This entry was posted in ALDLAND and tagged bcs, cfp, college football, playoffs, tom osborne by AD. Bookmark the permalink.